Suvik Electronics Pvt. Ltd. - The GREEN Power to empower Your Business. Subscribe to receive periodic updates for news, product launches and special offers from Suvik. 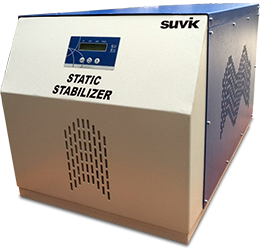 We take immense proud in introducing our newsletter 'Suvik Post', meant for Technology trends, Product Innovations and Showcases in the field of 'Power Quality' and 'Motion Control' for industrial sector. Suvik Post is power packed information source on power domain. Technology Pavlion : Why PWM controlled IGBT based Static Voltage Regulator? Voice of Customer : Customer Feedback Report received from ABB Ltd.
Quality Credential from Hyundai for VFD. Launch of Small Motors & Gearheads. Applications of Small motors & Gearheads. Upgrading SCVR for Digital experience. 4 Quadrant operation of Induction motor. Technical Spes of Hyundai MV Drive. Energy Saving with VFD on Pumps. Energy Saving with VFD on Fan. Quality Audit done by Mamata Brampton Engineering Pvt. Ltd the end user. Vendor Certification Audit done by Essar Telecom Infrastructure Pvt. Ltd.
Suvik participating in Elecrama 2008 exhibition with a bang. Technical Note on how Buck-boost and PWM topology help OEMs operate equipment in countries with mains fluctuating outside design limits. Suvik Handshake for latestet technology in stabilizer PWM-IGBT based. Introduction of how PWM-IGBT based technology of stabilizer works. Introducing higher KVA Delta Online UPS "NT-Series"
A joint venture assessment by Japanese Company - Meidensha for promotion of "State of Art" Power Solutions. Launch of "Delta UPS Series"
New product launch "Energy Saving System - CESS"
Launching the power packed information source "Suvik Post". © Suvik Electronics Pvt. Ltd. The site is designed for the modern browser for optimum surfing experience.